Classic Peppermint Bark is a perennial holiday favorite! Long Grove Confectionery has created one that is sure to please even the most discriminating. 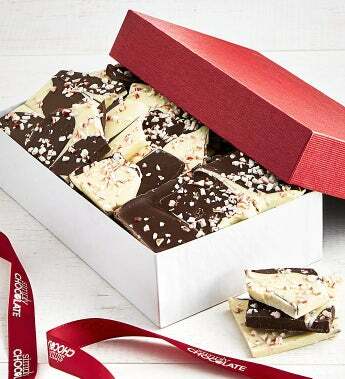 Dark Chocolate and White Chocolate are gently flavored with peppermint, swirled together, and then lightly sprinkled with crushed candy cane. A melt-in-your-mouth sensation that adds a festive touch to any holiday gathering. Gift Measures 8" x 4.75" x 2"